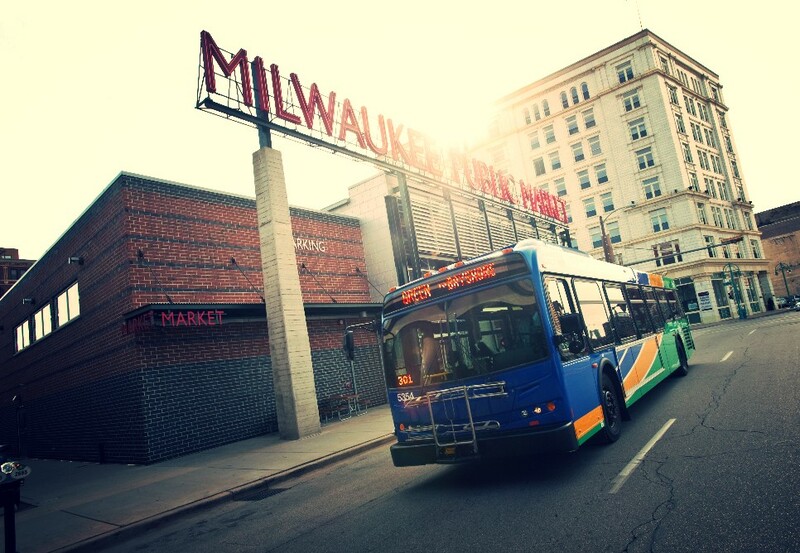 Traffic and parking are a breeze when you ride to Summerfest on the bus! 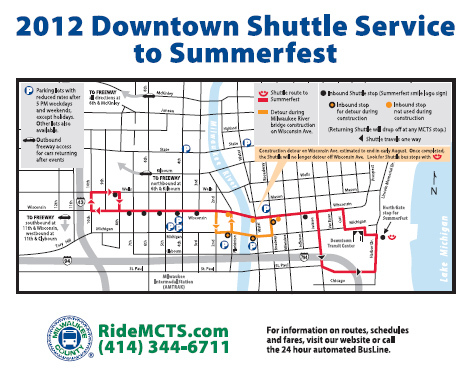 The Milwaukee County Transit System (MCTS) offers several choices for an easy and convenient ride to Summerfest, Wednesday, June 27 to Sunday, July 1 and Tuesday, July 3 to Sunday, July 8, 2012. Traffic and parking are a breeze when you ride to Summerfest on the bus! 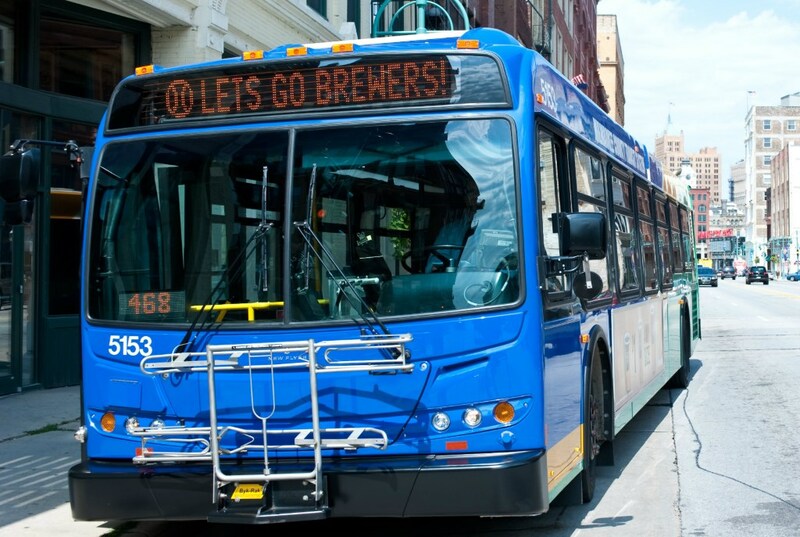 The Milwaukee County Transit System (MCTS) offers several choices for an easy and convenient ride to Summerfest, Wednesday, June 27 to Sunday, July 1 and Tuesday, July 3 to Sunday, July 8, 2012. Riders can drive or take a bus to the downtown area and take a Shuttle to the Summerfest North Gate. Those farther out can park at one of 10 park-ride lots and take a Freeway Flyer to the Summerfest Mid Gate, while those traveling from north of Milwaukee can take the Ozaukee County Express. The Shuttle operates Downtown from 11:30 am to 12:30 am every day during Summerfest and provides service to the North Gate. Bus service runs every 7 to 10 minutes. Buses operate in both directions along Wisconsin Avenue, except where the bus detours to travel along Michigan Street during the Milwaukee River Bridge construction (see map). When traveling to Summerfest, the Shuttle stops between N. James Lovell Street and N. Jackson Street, then proceeds directly to the North Gate. Stops are made at all bus stops marked with the Summerfest smile logo. Those parking away from Summerfest will have easy access to the freeway with less traffic when they leave downtown. Individuals going north, south or west, can enter I-43 from 6th and McKinley. Round trip adult fare is $3.00 while children (6-11), seniors (65 and over) and persons with disabilities with proper ID pay $1.50 round trip. Pay when boarding to Summerfest. Riders can still use a valid transfer or weekly pass as fare. Also, more than 10 regular MCTS routes travel to the downtown area from which riders can connect to a Shuttle. 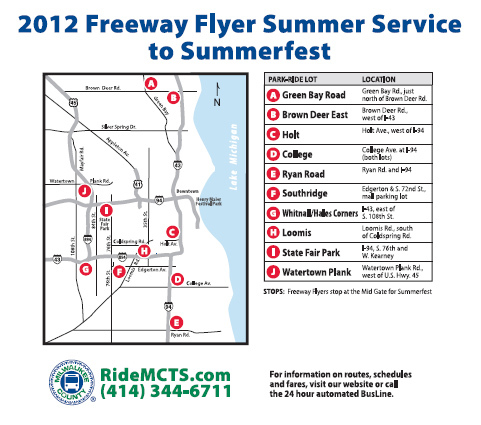 Freeway Flyers operate from 10 park-ride lots to the Summerfest Main Gate (see map). Unless otherwise noted, Flyers provide service on weekdays, every half-hour on the hour and half-hour from 11:30 am to 5:00 pm, and every 15 minutes from 5:00 pm to 12:30 am. On Saturdays and Sundays, service is every 15-20 minutes, except service to the Southridge Park-Ride Lot, which is every 15-30 minutes on weekends. Green Bay Rd. – (Route 49) Green Bay Rd., just north of Brown Deer Rd. Loomis – (Route 47) Loomis Rd., south of Coldspring Rd. State Fair Park – (Route 44) I-94, S. 76th and W. Kearney. Whitnall/Hales Corners – (Route 43) I-43, east of S. 108th St.
*Southridge Park-Ride Lot weekend service is every 15-30 minutes. Round trip adult fare is $6.50 while children (6-11), seniors (65 and over) and persons with disabilities with proper ID pay $3.00 round trip. Riders with a Weekly or Monthly Pass add $2.00. Also, on both the Shuttle and Freeway Flyer, U-PASS, Freedom Pass and Commuter Value Pass are accepted as full fare. Ozaukee County Express provides half-hour service from 11:30 am to 12:30 am each day, starting at the Saukville Wal-Mart (Hwy 33/Green Bay Ave.). The bus will depart 13 minutes later from the Target/Home Depot (Hwy 60) in Grafton. On weekdays and Saturdays from 5 pm to 9 pm, and Sundays from 1 pm to 6 pm, service increases to every 15 minutes. Fare is $6.50 round-trip for adults and $3.00 round-trip for children (6-11), seniors (65 and over) and persons with disabilities with proper ID. Riders with Weekly or Monthly Pass add $2.00.